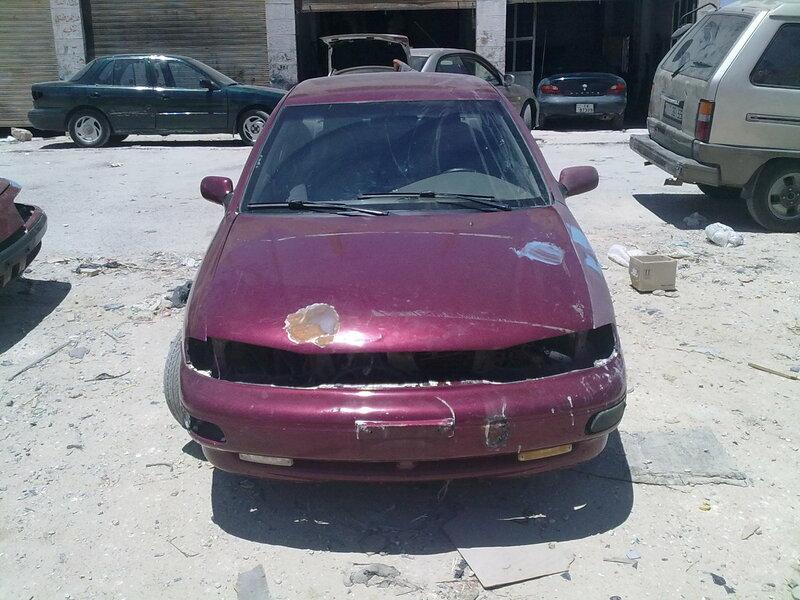 How Can You Mend a Broken Car? 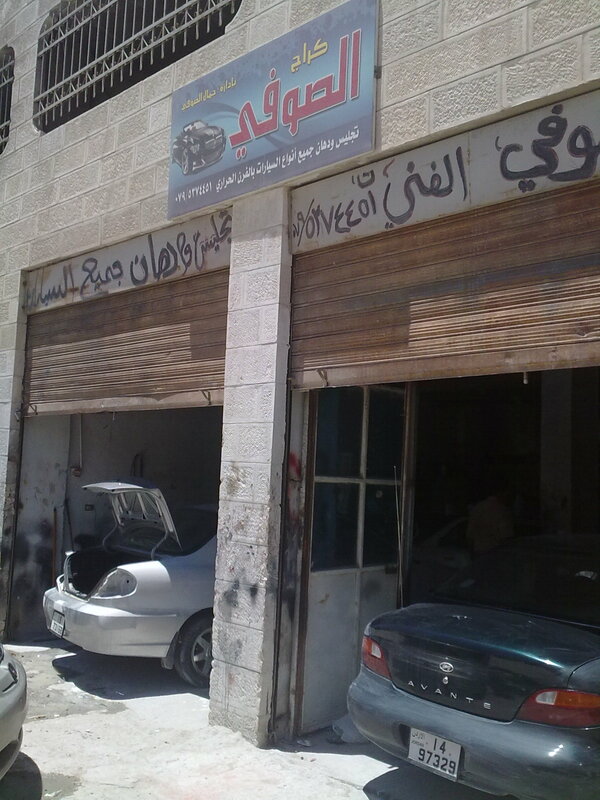 Perched on the side of one of Amman’s many mountains and flanked by carpenter’s shops and garages, Jamal Assufi’s auto body repair shop is smack in the middle of a drab, colorless, run-down, and some say ‘not so safe’ neighborhood. The ground floor of the long building is mostly filled with furniture makers, but there is a mechanic’s garage and Jamal’s place at the end. Looking over the building, I was somewhat amused to see three somewhat fancy entrances spaced along the facade. Soon I realized that the first floor housed flats. Yes, people live over the businesses. That’s fairly common here. Balconies were filled with drying laundry and plastic outdoor furniture. It’s by far the newest and best looking building on the desolate looking street. On the other side of the ancient, disused railroad track are much older buildings that are not wearing their age very well. It’s a very poor neighborhood where people have to do pretty much anything they can lay their hands to in order to scratch out a living. Thanks to the driver of the car pictured here, we needed some minor body work done, so Zeek and I spent a very interesting day. This was the third trip for the car. I stayed home for the other two. 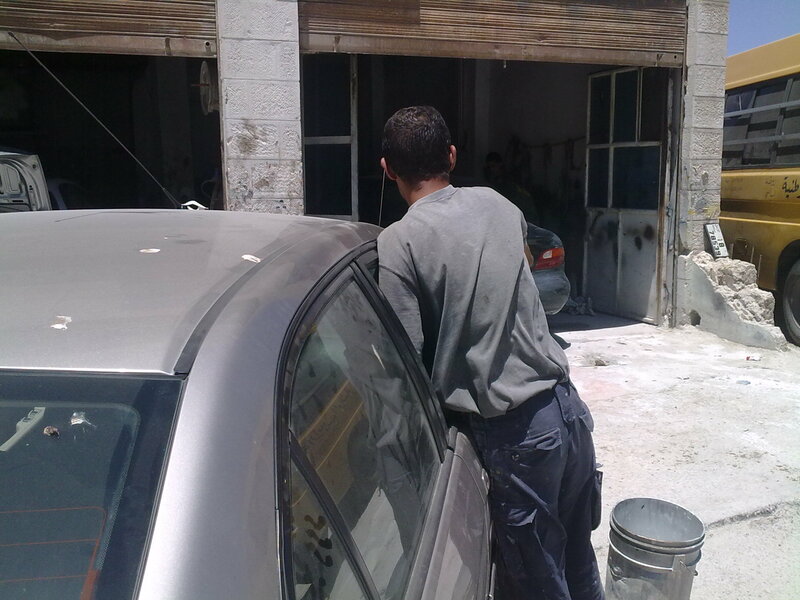 The first day Jamal applied the compound and resculpted the lines of the front and rear bumpers to fix the dents, and the following day was spent at the paint shop a few kilometers away in the industrial section of Amman. The paint was mixed by eye and didn’t quite match, so Jamal wouldn’t accept it. I decided I needed to experience this, myself because back in the States you would rarely be allowed in the working area of such places. We arrived just before midday. The men were just getting ready to break for lunch. Naturally, we were invited to join them for hommos, foul and falafel washed down with hot tea and mint. 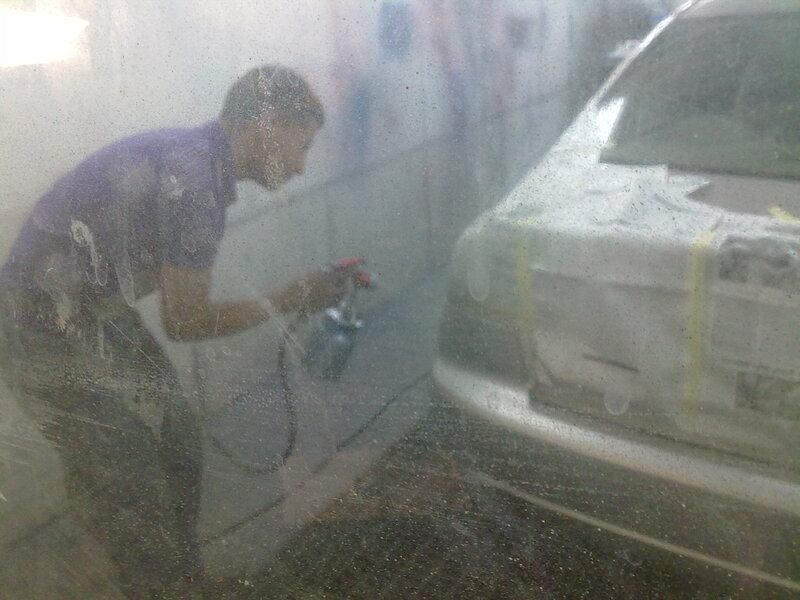 However, we had only just finished our own lunch, so I wandered about the shop looking at the tools and the injured cars waiting their turn under Jamal’s artistic hands. After a thorough wet-sanding we were dispatched to the paint shop, or furnace as it’s called here. The lengthy discussions about the nature of the work commenced before I could even heave my bulk out of the car. Eventually, the color number was copied from the door-plate and the paint guy spent several minutes ensuring it was the correct match. 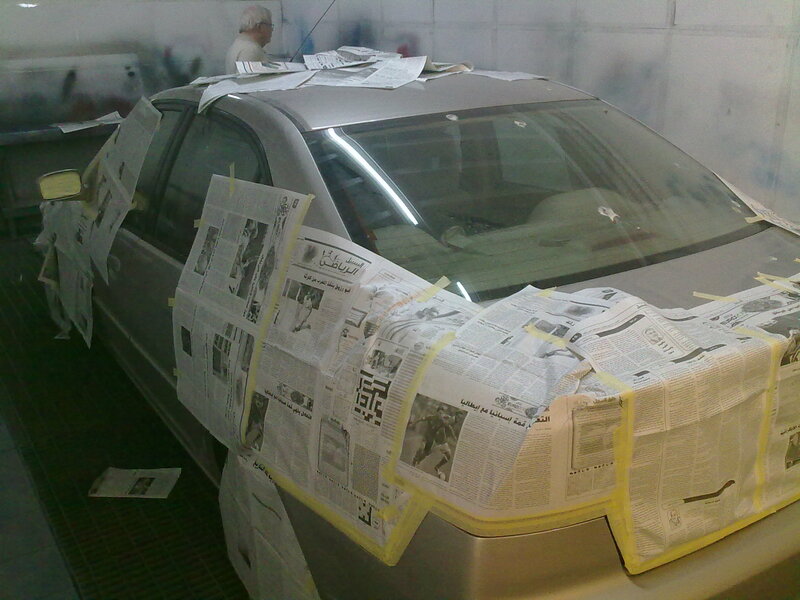 By the time we finally left for the paint shop several hours had elapsed. Halfway down a narrow alley, with cars and trucks parked (and half-assed parked) on both sides, we suddenly veered right and down a very steep ramp to the painter’s, located under one of the buildings. There was a truck in the paint booth and three cars papered and taped, waiting their turn to restore their former beauty. Some chat and a bribe of coffee moved us to the front of the line. 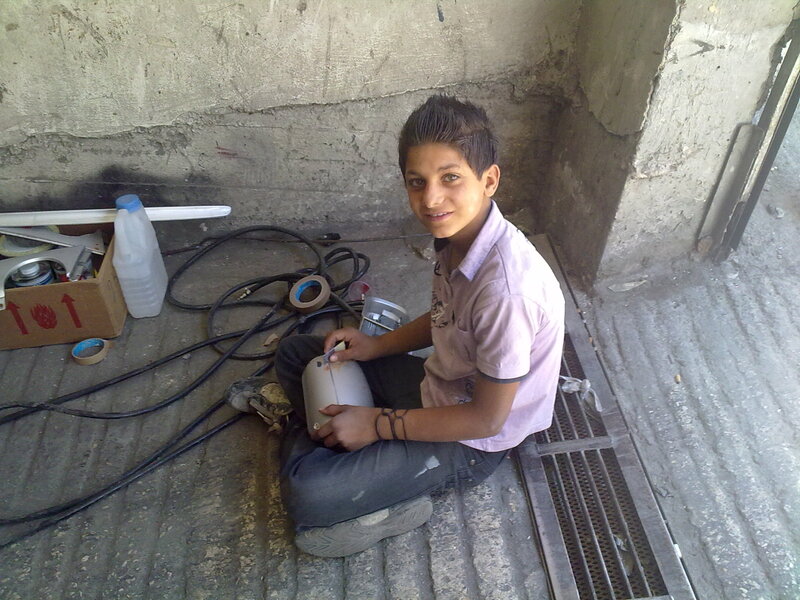 The boys working in the shop were all quite friendly, but professionally intent on their work. The one exception was Yahya (John). Yahya was buzzing about the shop, getting his fingers in everything. He wiped this, picked up that, moved something else. For the most part, the painters just swatted him or brushed him off like a pesky fly. It was clear though, that he was a beloved member of their group; something of a mascot. It’s odd that an 11 year-old boy would remind me of my Dad, but Yahya did. With all his flitting about here and there, I was reminded of acting the same way when I was a boy. I’d be happily and excitedly jumping about when my Dad would finally have had enough. 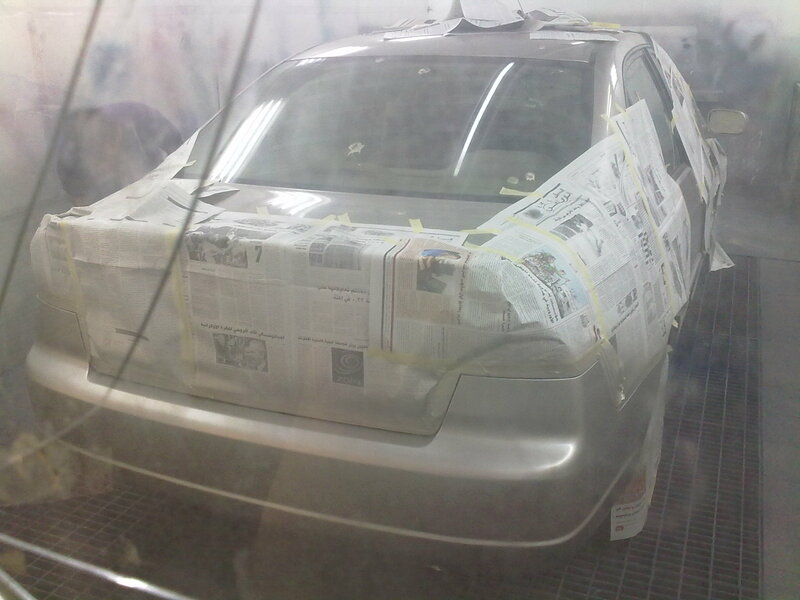 After the car was neatly wrapped and taped, it was off to the paint booth, or furnace. We were able to watch through the door windows. We were even invited to come inside to watch as he painted. I declined that particular kindness. Within an hour, we were on our way home with the car looking as if nothing had ever happened. It was a very entertaining day and I learned a lot about mending a broken car. 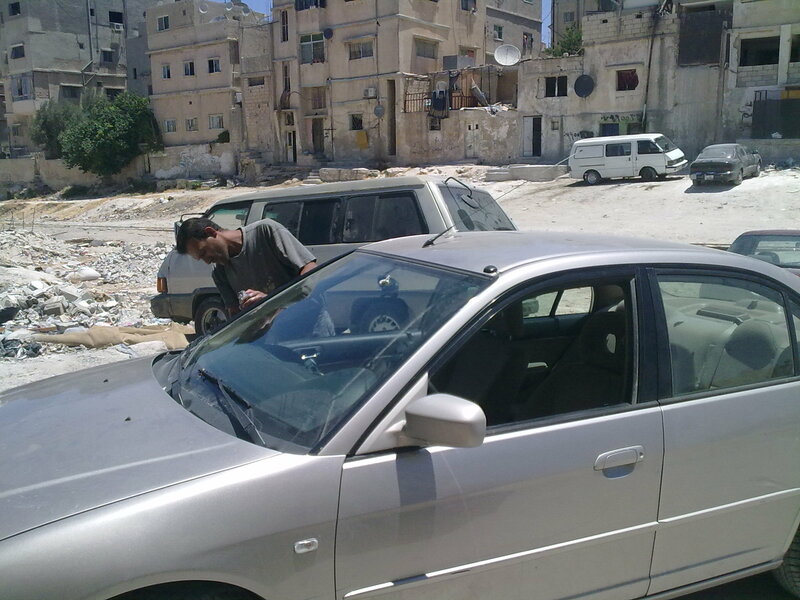 This entry was posted in Random Musings and tagged car, Jordan, paint, random thoughts, repair, writing. Bookmark the permalink. 8 Responses to How Can You Mend a Broken Car? I somehow missed where you are located… What an entertaining post. I really loved envisioning a middle eastern country (hope I got that right) and how they work. Especially loved the picture of the boy. Culturally educational! Thanks for sharing your world–great post! Awh, thanks so much for your kind words! 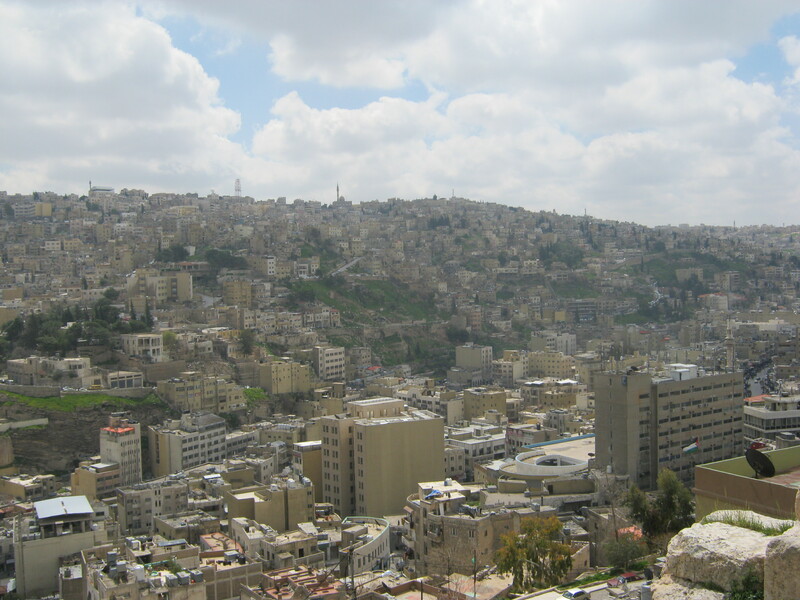 I live in Amman, Jordan so you got it right. Every day here is an educational experience that I’d recommend to anyone! Thanks for the comment! Having lived in both worlds, I think you’re right. Many jobs here are still reliant on the skill and expertise of the craftsmen and the quality is unbelievable. 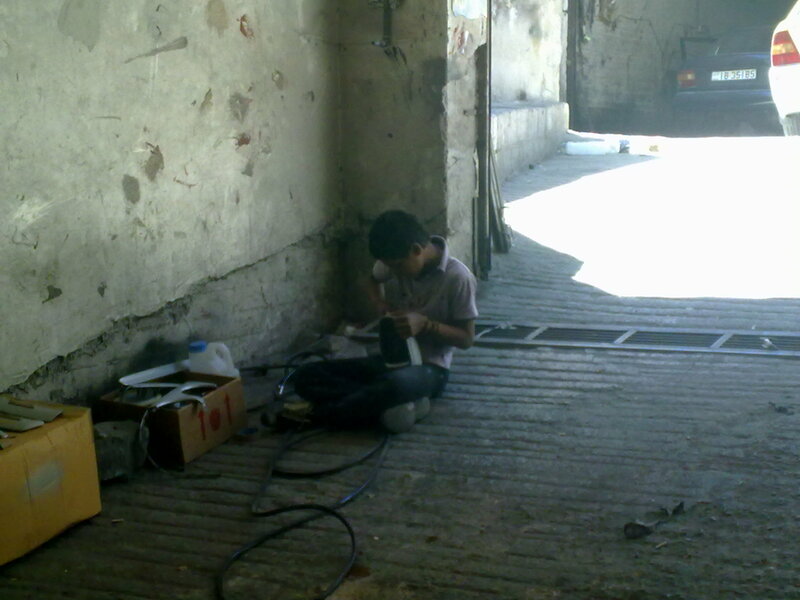 Would you believe that every piece of furniture in my flat was made right here in Amman, in small shops, by hand? It’s a great adventure! I remember going there only twice when I was a kid, seeing this post made me realize that I missed much of my experience of that place. I only went there and stayed in a hotel or went to the beach, but nothing that interactive… not like what I do in Egypt. Interesting as always. Like the boy. Our children in the U.S. truly have no perception of what life is like for children living in other parts of the world. My other half was born in Cairo and lived in Kuwait as a boy. He told me that at that time, the Kuwaiti upper class were so monied that when their cars would break down they’d just leave them at the side of the road and buy new ones. Thanks for coming by! I’ve heard that story about the Kuwaitis, too. When I watch the kids on this side of the world I’m always struck by how differently they have to live compared to Western children. It’s like a different planet I’m sure. Our kids think hardship is if they’re apps aren’t working.